In the summer, the best side dish is Kyuri, Myouga to Shiso no SIOMOMI (A type of salt pickles with Cucumber, Japanese ginger and beefsteak plant. ), in the winter, the best garnish is this. In a pinch it's also good for lunch-boxes. I follow it from Ms. Katsuyo Kobayashi's books repeatedly. If you can adjust soy-sauce perfectly, the taste will be incredible and wonderful. When you try at first, it's better to add less soy-sauce them you want to add. Additionally, it's very easy to make and it takes just 1 night. Cut Daikon into bite-size pieces. Cut Daikon into Hyousi-giri size (width 1 cm x length 4-5 cm). Rind a Yuzu and then slice thin. 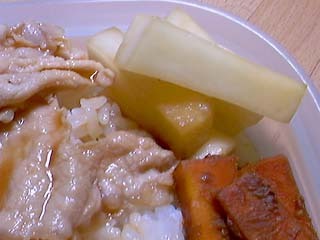 Put Daikon in a plastic container and then add soy-sauce 1/3-1/4 the amount of Daikon and Yuzu. This is the side view of the plastic container. The best amount is a ratio of 1/3-1/4 soy-sauce to the Daikon soaking. Oops, don't forget adding the Konbu kelp! And cover the plastic container and shake ingredients well. I made it late at night, (around 11:00 pm), and in the following morning (around 7:00 am), you can see the water drained from Daikon.